It is my intent to keep this post short but it has been a most interesting weekend and there are quite a few exciting developments to share. 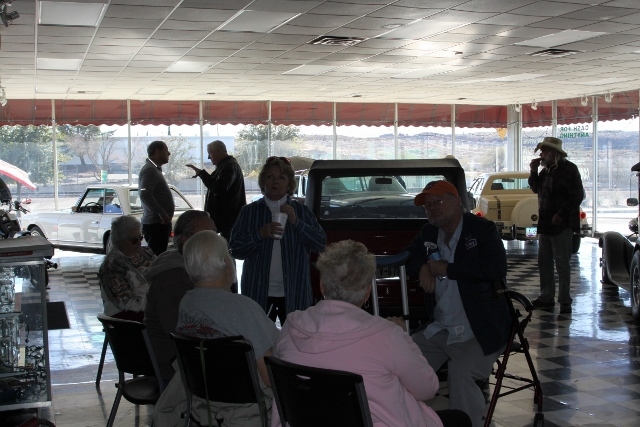 On Saturday afternoon, the Route 66 Association of Kingman hosted their December meet and greet at the Dunton Motors facility, a dealership that opened on Route 66 in 1946. As it turns out this is also the offices for the association, and where I now have an office with reception area to meet with tour groups as well as media. It was quite a turn out with about thirty or forty people in attendance. Mr. D’z Route 66 Diner supplied the hamburgers and root beer, and Castle Rock Trading Post provided a few of their signature pizzas. I should note, the association website isn’t quite ready but there is an association Facebook page that is updated almost every day with event information, membership application information, Route 66 related developments as they pertain to Kingman, or historic photos from collectors such as Mike Ward, Joe Sonderman, and Steve Rider. Look for the the Route 66 Association of Kingman Arizona page. As these monthly meet and greet “parties” are always open to members and nonmembers alike, they are a great place to network, sample a bit of the local cuisine, meet with area business owners, learn about new developments, and plan events. If your traveling through town, and the trip coincides with the monthly event, stop by. Next month the associations get together, scheduled for January 16, will be a bit different as it is the fund raising kick off for the restoration and installation of neon signs that is a part of the 66 Celebrates 90 initiative. There will be a $25.00 per person charge but in addition to the my presentation, a virtual tour of Route 66, there will be a dinner catered by local downtown restaurants, a silent auction, and afterwards, a pub crawl in the historic district. For more information, or to purchase tickets, contact Jamie Taylor at Just Marketing, (928)530-2056. Seating is limited. At the get together on Saturday, I met with Peter Gossow, the new proprietor at the old Lake Mead Rancheros complex, now the world famous home of Giganticus Headicus. Extensive renovation is underway and he is making plans for hosting several events next year. I introduced him to the Plugshare website. Did I mention that he has facilities for charging electric vehicles? I also met with, and had a lengthy discussion with the pastor for the church that is pushing to utilize the historic Central Commercial Building as their new facility. It was an amicable discussion but I reiterated my position; I support the church and its programs but the building they want to use is the center piece for a commercial district that is struggling to become economically viable. Simply put, this is the wrong use for this historic building. On Sunday morning, I provided assistance to Josh Noble, the area tourism director, as we shared a few of the Kingman highlights to an international media relations tour hosted by the Arizona Department of Tourism. Our adventure focused on the Powerhouse Visitor Center, and a few often overlooked attractions such as the historic Bonelli House, Desert Diamond Distillery, a state of the art facility known for its award winning Gold Miner Agave Rum, and the Kingman Airport, site of the expansive WWII era Kingman Army Airfield. For lunch we hit the Kingman Airport Cafe, a diminutive little restaurant with some of the best burgers anywhere (just a few short blocks south of Route 66). 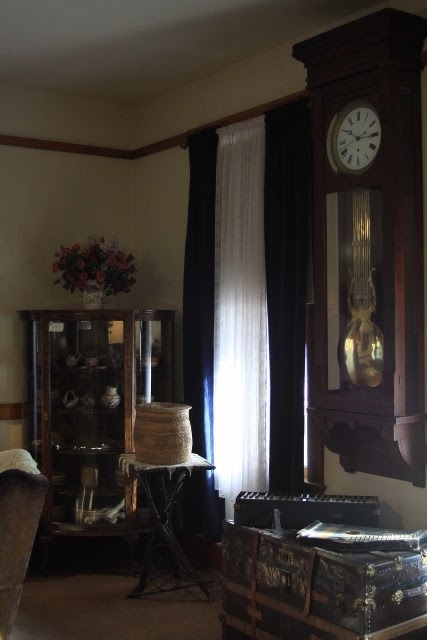 The Bonelli House is a most fascinating old home. 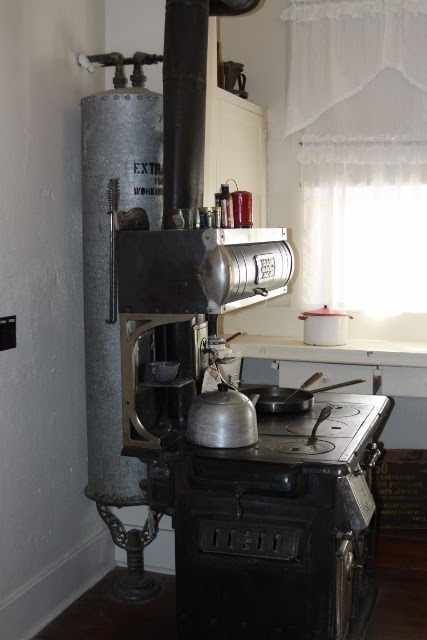 Built in 1915, it retains a surprising array of the original “modern features” that made it a showpiece in its time. This morning I provided an interview to the marketing company that is developing promotion for Alamo Rental Car. The subject of discussion was Route 66 with a focus on Kingman. I also confirmed an appointment to interview Nick Adams of the Ariston Cafe on Tuesday, and left a message for Allan Affeldt of the La Posada. The new book is shaping up to be unlike anything I have yet written. Also on the schedule for Tuesday, a meeting with the owners and management of Ramada Kingman. The topic of discussion is on going renovations and upgrades, how to market the property as the cities only full service Route 66 resort, and event development in 2016. In spite of the interviews and meetings, including one this evening with the Hualapai Tribe and lodge to discuss tourism and marketing in 2016, and a phone conference with Open Road Productions to discuss the proposed Route 66 tour next fall, the primary focus will be to make an e-book version of the latest book available, and to move the current project closer to completion as I play another round of beat the deadline. Okay, to wrap this up, in recent weeks I have received a surprising number of inquiries pertaining to availability for presentations. To schedule an event and discuss financial compensation there is a link tab at the top of the blog header with contact information. January 4, a morning interview on Morning Scramble, cable channel 7 in Prescott. January 16, the presentation in Kingman. January 22 through 24, we will be following Route 66 in California to gather photos for the new book, and to meet Candacy Taylor to discuss her fascinating project. The schedule is somewhat flexible so I would be available for a presentation. April 14, a presentation at Ramada Kingman. April 23, an event in Lebanon, Missouri. July 11 through July 19, the European Route 66 Festival in Germany.